When it comes to choosing cool or unique stocking stuffers, you have to think outside the box. Or stocking. Which is exactly what we did when compiling this list of stocking stuffers that are ridiculously cool! Whether looking for kids, cousins, colleagues or your better half, you will find unbeatable ideas right here. Goodness nose where you left your glasses. That’s right, on the nose! This adorable ‘face’ is carved from Sheesham wood by underprivileged artisans in India, helping them beat poverty while helping YOU find your glasses! No more looking for spectacles or the perfect stocking stuffer, this carving kills two birds with one gift! Are you looking for the purrfect stocking stuffer for the crazy cat lady or gent in your life? 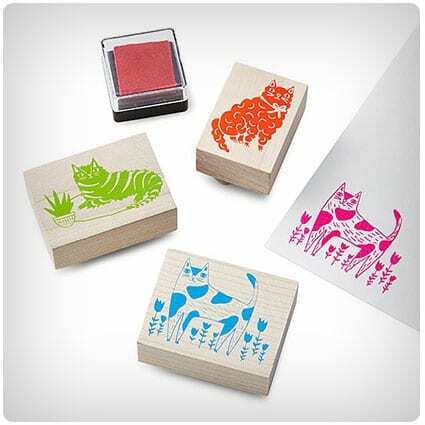 Just paws a while and take a look at this gorgeous set of cat stamps from Uncommon Goods. No surface will be safe from neon pink felines once that cat lover gets their hands on this gift! ‘Draw’ on childhood memories when looking for stocking stuffer ideas with this incredible black light putty. Simply shine the black light keychain (included) on to the putty and watch as your words or drawings glow! As if that wasn’t enough, this non-drying putty glows in the dark and even changes color in the sun! Great gifts stem from great ideas, and these puzzles will really test those STEM disciplines! Each one requires Science, Technology, Engineering or Mathematics to solve, and will really push that gray matter (or the left side at least). Makes a great stocking stuffer for the critical thinkers, or for those who overdosed on Hallmark movies! It seems nowadays surgery is the only way to remove us from our smartphones. Drawing on that obsession, the Game of Phones is an ingenious card game which requires players to use their cellular companions in order to complete the task, whether it is drawing, texting, or googling. Fast phone fun for friends and family. Channel your inner Rudolph this Christmas by slipping a clown’s nose into someone’s stocking, especially if they are of the Bah Humbug variety. No one can be glum wearing a honking great hooter, and laughter really is the best medicine for curing those winter blues. It sure does beat finding a lump of coal in there. Shake it up baby – mealtimes that is. This set of five foodie dice makes it easy (and fun) to choose what to cook for dinner. Each dice represents a different facet of meal-making, and together offer more than 186,000 possible combinations. Just place them in the muslin pouch, shake, and bake. Or fry. Or broil. If you’re feline generous this year, this card game is the cats’ whiskers. Each player morphs into a puss and makes their way through the game, doing what cats do best – causing mischief! Outsmart your opponents to finish first. A fun gift for the crazy cat lady (or man) from Santa Claws. You herb it here first! This Growbottle makes a stocking stuffer that is truly unique for the chef on your list. Using a soilless method of growing, this indoor hydrogarden is contained within a refashioned wine bottle, and allows an herb of choice to grow on a windowsill for fresh delicious herbs all year round. You won’t believe your eyes as you watch this magnetic putty literally reach out to touch the Neodymium Iron Boron magnet that comes with it, oozing and stretching until it has it in its grip, or swallowing the magnet whole in the space of an hour. Weird fun for science loving geeks. We can’t wax lyrical enough about this superb 2-in-1 body lotion candle from Uncommon Goods, which burns as a normal candle, but melts into a gloriously scented body lotion. Made from soothing oils and vitamins to nourish your skin and tantalize your nose, this fig and amber candle makes a sophisticated and unique stocking stuffer. This Christmas, come bearing fruity gifts in the form of this uber-useful fruit infusing bottle. For deliciously healthy water, simply place fruits of choice into the bottle, add water, and refrigerate to allow the fruits to infuse. This would be a great stocking stuffer for anyone with a New Year’s Resolution to be healthier. Strip your gift giving right back by slipping this kale and herb razor into someone’s Christmas stocking this year. With three different holes for varying thicknesses, this handy gadget quickly separates herbs and kale from their stems, leaving the user with only the best bits. It’s truly a Thymeless gift. This adorable cotton pouch might not be able to carry quite as much as the llama that is pictured on its front, but it WILL carry loose change, keys, cash or cosmetics with ease. In the colors of the sunny Mediterranean, this little bag takes all the drama llama out of buying unique stocking stuffers. Anyone who sees this great bowl is going to exclaim ‘Ooma gonna get me one of those’! Designed for casual dining (ok, eating on the couch) this stoneware ergonomic bowl allows comfy handling while keeping delectable duos separate, because nobody likes soggy chips or stuff in their dips, until they put them there, of course! Bring a dog lover to heel with a pair of socks which depicts their favorite kind of canine. Whether they are a French Bulldog fancier, Labrador lover, or fond of a different breed entirely, these socks will finish off a dog walking outfit pawfectly. It’s fandom of the furry variety. If you ever feel like your parents just don’t understand you, you’re probably right. Bring their vocab bang up to date with this set of slang flashcards, which feature a slang expression, along with pronunciation, examples, and a handy drawing to really labor the point! Makes a bangin’ stocking stuffer for the P unit. Word. Pamper someone’s peds this Christmas with this overnight foot-care kit. Tired tootsies can be massaged with the luxurious rosemary-mint scented cream before slipping into the super soft socks for a good night’s sleep while the cream works its magic. We can guarantee whoever uses it will wake up with a spring in their step! Make space under the tree for one of these interstellar puzzles, which, while perhaps not quite as difficult as solving the mysteries of the universe, are little slices of Heaven sent perplexities. Made from locust wood, there are five to choose from, all based on a cosmic phenomenon perfectly suited to galactic geeks. Seasonal seasonings make superb stocking stuffers, and there are none more superb that these! In flavors such as espresso, wild blueberry, and rose peppercorn, this set of six dessert and baking salts will delight and confuse the taste buds in equal measures, while opening up a whole new world of flavor combinations. Turn mealtime rules on their head and confuse the heck out of your kid by positively encouraging him or her to play with their food! This bowl, designed by an 8 year old, makes fair game of morsels as they aim their food into the basketball hoop attached to the side. Slam dunk! What makes the ice melt? Blood! Thankfully these hockey pucks are made of sandstone and not blood, so there will be no ice melting in your favorite beverage. Reusable, this set of three pucks can be frozen and used over and over again. A cool stocking stuffer for those on the n-ice list. Keep a ‘stash of these pacifiers to slip in the littlies’ Christmas stocking for some much needed peace for frazzled moms and dads. No matter how near the end of their tether they are, parents will not be able to stop laughing at the sight of their mustachioed muchachos. Give a wordsmith some inspirational words of your own by giving them this unique stocking stuffer! Each of the five pencils bears an inscription designed to motivate and cheer, so even when their muse fails them, your sentiments won’t. Alternatively they’re great for writing shopping lists. Or doodling. Or even chewing. Actually no, not chewing. Breathe some life into someone’s garden with these convenient garden pollinators. Each nutrient-rich pack of three contains seeds which have been specially chosen to attract butterflies, bees, and hummingbirds, making it a gift for the gardener and the globe. Just break up the soil, blend the grow medium, and scatter the seeds before watering. Picks are like pens, you can never find one when you need one. This pick punch is a great idea for the guitarist who finds himself in a jam (or not). Old credit cards and membership cards can be used to produce a plethora of plectrums with just one punch – it’s music to their ears. Conversation is a dying art, thanks to technology, and we have all but forgotten how to have a decent one. Table Topics puts discussions back on the table, literally. Each cube holds 135 conversation starters for stimulating dialogue over dinner, drinks, or just off-screen time, with different sets aimed at different groups. Ready… and… discuss. Don’t scream for ice cream when you can’t get it out of the tub! Leave that froze-stration behind with a heat-conducting ice-cream scoop! The biodegradable liquid in the handle interacts with hand-heat and transfers it to the scoop, meaning the only delay will be in choosing your flavor. Makes a very n-ice stocking stuffer! Nobody will wine about this gift when they’re enjoying their favorite tipple at the perfect temperature. These wine pearls, once frozen, can be added to wine to lower the temperature as little or as much as you like – the more pearls the colder the drink – and unlike ice there’s no dilution. What a brilliantly cool idea! Don’t get yourself in a state over stocking stuffers! Dish out these towels to everyone who has a kitchen (so, everyone) and personalize each one to represent their State. They could be washing-up in Washington, cleaning up in Colorado, or drying the dishes in Delaware. Makes a nice touch for the home from home. Doctors, nurses, or anyone slightly ghoulish will really heart these plush organs. If you lung for a gift that is both cuddly and macabre, choose one of the 13 different organs available – no kidneying, it’s definitely a gift that will liver on and on in their memories, if they can stomach the sentimentality, that is. For a truly grate stocking stuffer, this dipping dish can’t be beaten. The beautifully rustic looking bowl is hand thrown on the pottery wheel and has a rough center, perfect for grating garlic straight in to the bowl. Simply add oil for a delicious Mediterranean favorite. Choose this and you’ll have gift-buying gar-licked. There’s no use crying over spilt onion juice, and these goggles stop those wasted tears. The comfortable foam creates a seal around the eyes, keeping painful enzymes out, while allowing the cook clear vision, otherwise they might cut themselves, and then there would be tears! Stick it in their Christmas stocking and tell them ‘that’s shallot’. Give someone a gift that will really hit the spot. The tension acupressure spot, that is. This green clip sits neatly between the forefinger and thumb, applying pressure to the corresponding pressure point and alleviating headaches, backaches, and other tension-related aches and pains. And let’s face it, Christmas with the in-laws creates a LOT of tension! There’s avocado lovers, and then there’s avocado lovers. If you know someone who really embraces that knobbly little pear, give them a set of avocado huggers to really keep their fruit fresh. Designed with a pit-pocket to suit an inny or an outty, these huggers keep a cut avocado fresh and unspoiled for enjoyable eating. This salted honey really is the Bees Knees. Made from wildflower honey from the Hudson Valley, and sea salt, the taste combination is guaranteed to get you buzzing! Whether you want to make your sweets sweeter, or your savories saltier, this honey is the multi-tasker of condiments. If you’re ohm-ing and ah-ing about what to give to the yogi on your gift list, this set of yoga dice makes an excellent stocking stuffer. Each dice features one of seven asana categories, so no matter how you roll, you will end up with a full set of poses for a perfect yoga workout. Don’t bar soaps from your gift itinerary this year, or someone will end up wine-ing! These intoxicating soaps bring together notes, scents and oils which, when combined, create delicately scented bars of showering chardonnay, pampering pinots, and cleansing cabernet for a tub-time treat you can really indulge in. If you’re playing a round with choosing gifts for the golf enthusiast, you can’t go far wrong with this hole in one mug. As they take a breather at the 18th, they can practice their swing by using the miniature golf club and ball included, ‘putting’ their break time to good use. Turn over a new leaf – tea leaf, that is – with these gorgeous bird mugs from Uncommon Goods. Each one (and there are seven to choose from) displays a cheerfully colored guide bird which represents a quality that the receiver possesses or even needs reminding of. They’re a great way to show someone you really care. Like newly fallen snow, these blank library card socks are just begging to be stamped on! Anyone who remembers the old-fashioned method of book borrowing will appreciate these fun socks, which will spark memories of days spent in the library, or curled up with a well-thumbed book at home, making them great stocking stuffers for bookworms. Lovers of classic literature will adore these sets of puzzles, each based on a children’s classic. Each set comes with five brainteasing puzzles – will you be teased by the Tin Man, perplexed by the Treasure Island pirates, or perhaps Never-Never solve Peter Pan’s puzzles? Makes a perfect gift for the king or queen of your heart. Create a mealtime mash up with the Mr. Food Face Plate. Take one face (included) and add a bacon beard, macaroni mustache, hash brown hair and bean brows for creative mealtimes and fun food. Makes a fab stocking stuffer for kids (or adults) who love to play with their food. Crack open a cold one with the bike chain bottle opener, and satisfy your thirst and your conscience. Made from real recycled bicycle chains, these openers keep broken bicycles from ending up in landfill sites, making them good for the planet, and, let’s face it, they look pretty cool!